Place the shredded coconut in the bottom of a pie pan and spread evenly (this will help the pie not to stick). Place the rest of the crust ingredients in a food processor and process until crumbly and well-combined (but still airy). Press the crust ingredients into the pie pan and form an even crust. Put this in the fridge/freezer until ready to fill. Place all of your filling ingredients into your food processor and process until creamy. Add the water or orange juice, but don't add too much! Just enough to get it a soft "yogurty" texture. 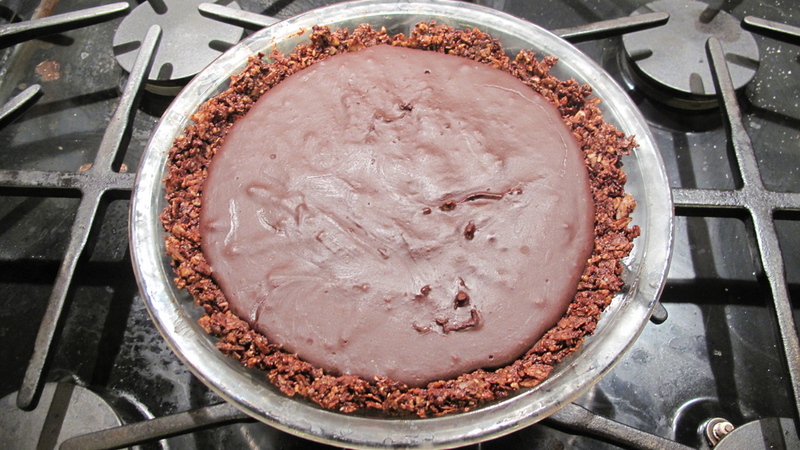 Pour mixture on top of your crust and spread evenly. *NOTE: You can pour 2/3 of the mixture, then add 1/2 cup of thawed berries (then blend), then pour on top of your base cheesecake layer for even cooler presentation. Wash the bowl of your food processor. Place all topping ingredients into food processor and pulse until well-combined (but not soupy). Sprinkle evenly on top of the cheesecake base. Freeze your cheesecake for at least a few hours, then thaw in the fridge until ready to eat. Enjoy! Thank you Deb, the amazing artist and photographer, for the wonderful recipe! Made a batch for our friend's dinner and they were devoured in a matter of minutes. Preheat your oven to 325 degrees. Line 2 cookie sheets with cooking parchment. Mix your dry ingredients in a bowl (the first four). Mix your wet ingredients in a separate bowl (the next three). Then add the wet mixture to the dry mixture and stir until combined. Then add the chocolate chips and walnuts and mix until evenly distributed. Form the cookies into little patties (you can use a tablespoon to get exactly the same amount of dough for each if you're a stickler for evenly sized cookies) and place them onto the parchment lined cookie sheets. Bake for about 13 minutes or until they're just browned. Allow to cool for 10 minutes before eating (yeah right! good luck with that!). Enjoy! May you enjoy the sweetness of this life! Here's a quick and easy recipe to fulfill your sweet tooth. Blend the cashews, oats, and coconut in a food processor until you've created a fine-ish powder. Add the syrup, vanilla extract, and almond butter and blend again until it sticks together to form a dough. Add the splash of almond milk if it doesn't turn dough-y. Add the chocolate chips and pulse briefly or mix in by hand. Roll the dough into little balls and put them on a parchment lined cookie sheet, or in a pyrex food container. Allow to chill in the fridge for at least 3o minutes. Serve and enjoy! Place all the ingredients in a blender and blend until smooth and creamy. You might need to stop the blender and stir the ingredients with a spatula a couple times just to ensure even blending. *Optional: Serve with a little wedge of lemon...squeeze a few drops of lemon juice over your bowl and enjoy! Cantaloupe/Honeydew: This melon is a plentiful source of vitamins A and C, as well as potassium. It is a powerful antioxidant and anti-inflammatory fruit, which means it can help us to fight off unwanted inflammation and oxidative stress in the body. See here for more health benefits and nutritional information. This recipe was inspired by Stephanie Eusebi Nutrition & Wellness. Looking to make a nice dessert or energy boosting snack? This recipe is super simple and delicious. Feel free to add other types of nuts or dried fruit to appeal to any palate. I added pepitas (hulled pumpkin seeds) to this batch and it was delish! Whisk the melted coconut oil into the egg mixture. Add in the vanilla, coconut, and chocolate chips (and optional maple syrup) and combine until well-mixed. Bake at 350 for 20-25 minutes or until the top and edges are golden and crispy. Allow to cool (if you have the willpower!). Slice off a piece and enjoy! Cacao: (Dark chocolate)Organic cacao is a legit superfood. It abounds with Vitamin A, C, and E, and a plethora of B vitamins, as well as, magnesium, copper, calcium, manganese, zinc, sulphur, iron, chromium, phosphorus, and Omega 6 fatty acids. It is also high in protein and fiber. Move over spinach! See here for more health benefits and nutritional information. My über adorable nephew was just here visiting, and I needed to come up with some energy-boosting snacks, stat. When you only have 2 minutes before heading off on an adventure (in our case we went snowshoeing in the high country...had to enjoy the last of the snow! ), then this is a perfect treat. I always have some dried fruit, and crispy (soaked and dehydrated) nuts and seeds on hand, just in case. This time we also added some raw cacao nibs and a few crack almonds chocolate covered almonds to make our mix chocolatey and delicious. Hope you enjoy this special snack and whatever kinds of adventures you can dream up! Mix all the ingredients and place in a container that can withstand your adventure (I don't recommend glass if you're going hiking, biking, running, etc....But I really hate plastic). Try a wax paper bag if you think it won't get destroyed. Grab a handful as needed and enjoy! Instead of fruitcake and candy canes, why not try a different kind of dessert that is sure to put everyone in a good mood? This chocolate bark recipe includes a drop of doTERRA's geranium essential oil, which is known for its ability to put even Scrooge in a good mood. Plus, the salty sweet combo is sure to please any palate, even this guy! Have a happy holiday, and don't forget to pass the chocolate! Add the drop or two of doTERRA geranium essential oil and stir until well-blended. Mix in a pinch of cardamom. Sprinkle with flaky sea salt, dried rose petals, and (optional) pistachios. Geranium Essential Oil: Geranium is analgesic, antidepressant, antibacterial, anti-infectious, antiseptic, and a tonic for the liver and kidneys. Geranium is also a hormone-balancing oil, and provides a sense of security and comfort. See here to learn more about doTERRA essential oils. Whoever invented the "slow cooker" is my new best pal. Who knew that it was so easy to cook beautiful, homemade meals with very little preparation? I recently discovered the crockpot that had been hiding at the back of our kitchen cupboard. Could it really be so simple as tossing a whole mess of ingredients in the crockpot, turn it on, come back a few hours later to a beautiful dinner? Pretty much. On days when you don't have a lot of time to cook, let a slow cooker do the work for you. When you ladle yourself a bowl of hot, yummy goodness, you might wonder why it has taken you so long to clear the cobwebs off this handy kitchen tool. Bon appétit! Add onion and pepper, and cook and stir until tender. Add garlic; cook 1 minute longer. Transfer to a 5-qt. slow cooker; stir in the remaining ingredients, except for the essential oil. Cook, covered, on low 4-5 hours. If desired, add 1-2 drops doTERRA oregano essential oil to the whole batch before serving. Garnish with avocado, cilantro, and/or green onions. Black Beans: These magical legumes are touted for their abundant protein and fiber content, but are also packed with antioxidant and anti-inflammatory phytonutrients such as folate, tryptophan, and manganese. Great for gut, heart, and overall health. Many suggest that soaking nuts (and grains, legumes, and seeds) before consuming them enhances their nutritional quality. See here for more health benefits and nutritional information. Bell Peppers: NOTE! Bell peppers, a member of the nightshade family, are not for everyone. They are on the "dirty dozen" list of pesticide laden produce (when not organic), and have been known to cause inflammation in some people. HOWEVER, they have lots of health benefits too: Sweet bell peppers are high in vitamins C and A, and contain other antioxidants. Don't cook over high heat or they loose some of their nutritional wallop. See here for more health benefits and nutritional information. Oregano Essential Oil: Oregano is a powerful antibacterial, antifungal, anti-inflammatory, anti-oxidant, anti-parasitic oil. It battles common intestinal, skin and lung infections, while fending off colds and flu. It is also a general nerve tonic. Be BEWARE! A dab will do ya. See here to learn more about doTERRA essential oils. Pumpkin: This tasty winter squash is packed vitamins A and C, magnesium and potassium, as well as dietary fiber. It’s also contains high amounts of carotenoids, the little nutrients which help to neutralize free-radicals within the body, and is low in calories. See here for more health benefits and nutritional information. As the mornings get chillier, our bodies naturally reach for more warming foods. We are naturally inclined to swap the raw green juices for nourishing breakfasts that help us stay sated for longer and keep us warm from the inside out. This chia porridge recipe was inspired by my very dear friend, Julie. Her recipe differs slightly, but that's the beauty of this simple recipe. It is completely versatile. Just add a scoop or two of chia seeds to some nearly boiling water. Whisk it every few minutes until it "sets" in a nice porridge-like consistency. Then add whatever else sounds good that morning: ghee, coconut oil, nut or seed butter, fresh berries, dried fruit (like goji berries or apricots), a scoop of protein powder, maca powder, or bee pollen, and perhaps a dash of honey or pure maple syrup if you like it a little sweeter. This delightful bowl of goodness will keep your belly full and happy for hours. What are your favorite hot cereal add-ins? Enjoy! 1 1/2-2 cups water dash of salt 2 scoops organic chia seeds 1 scoop high-quality protein powder 1 tbs. coconut oil 1/2 blueberries 1 drop doTERRA black pepper essential oil *Endless optional ingredients: walnuts, pecans, sunflower seeds, pepitas, honey, maple syrup, chopped dates, apricots, goji berries, shaved coconut, nut or seed butter, nut or seed milk, cinnamon, nutmeg, cardamom...you get the idea. Place water and salt in a saucepan and allow to come to a boil. Turn off heat. Add 2 scoops of chia seeds and whisk together to avoid clumping. Cover and allow to sit while perusing the rest of your ingredients. Three minutes later stir again. Allow the chia seeds to "gel" (should take just a few more minutes). Then add the rest of the ingredients and whisk together again until smooth, creamy, and well-blended. Serve and enjoy! Black Pepper: Black Pepper essential oil is great for your digestive system. It stimulates salivary glands and secretion of digestive juices meanwhile neutralizing gas formation in the intestinal tract. Also a great cleansing agent! Black pepper oil also increases circulation, reducing inflammation, and provides relief for arthritis and other muscle and joint discomforts. Great for athletes! See here for more.